The solid metal body keeps gears aligned even when under load, and the advanced Superline Spool eliminates a step: no need for backing, as the rubberized gasket stops slippage. HT-100 drag washers provide tough, smooth resistance. Six stainless steel ball bearings, Techno-Balanced™ spool, and machined-aluminum handle give perfectly smooth retrieves. ""i bought the battle 6000 and put it on my 7' ugly stick tiger lite and have used it for all kinds of fishing up here in alaska and it has performed awesomely for me, i use it for almost everything, from salmon to chicken halibut to rockfish to pacific cod, whatevers around i'm gonna get with my tigerlite and penn battle 6000, for the price its an excellent spinning reel..."
"This reel may not be a "Seven-six-two millimeter, Full metal jacket" as Private Pyle said in Stanley Kubrick's 1987 movie..... but this reel is all the amunition you need if you want value AND longevity in a reel. I fish from a kayak either in So Cal kelp beds or fresh water, and the 2000 series for me is as light as I go, although at times it's too small"
""I use this reel in straight surf fishing on the Texas gulf coast. 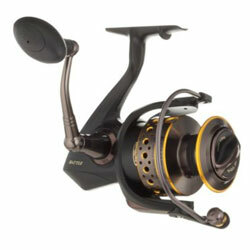 This reel has stood up to the harsh salt water crashing against it. With a good rinse and oiling it is ready for the next time. Great reel"